So what is it that makes people willingly take a glass-full of a bitter, thick liquid when they know that they will probably be bent over an hour later, purging not only their last few meals, but what the shamans believe are negative energies? Why subject oneself to this knowingly and repeatedly? That was something that certainly ran through my mind as I was bent over mid-way through the introductory ceremony. People not only pay money for this, but they actually come back and do it again? And again? Chris Kilham, more famously known as the Medicine Hunter, and senior health editor for Fox News, regards this plant brew as the most potent healing agent in the world. And since, by his own admission, he’s participated in several dozen ceremonies, Kilham is positioned well to hold this opinion. He now leads groups to the Amazon to experience for themselves the healing powers of this amazing plant. Known to the Shuar as natem, to others as ayahuasca, yagé, daime, la purga and many other names, this concoction has been in use for thousands of years in the Amazon basin. Now it is undergoing many clinical trials in South American countries following rigorous laboratory protocols. Kilham, investigating medicinal plants for more than 30 years and a tenured professor at UMass-Amherst, believes (as do I and thousands of others) that natem unlocks a spirit world and permits us to enter this world in a highly personal way. He also goes on to say that those who criticize, those who disbelieve the existence of this spirit world are invariably those who have never attended such a ceremony. Like the Medicine Hunter, I’ve always believed that it is so very easy to have an opinion, and a very strong one at that, of something about which someone knows nothing. The only thing that I knew, mid-way through that first ceremony, was that morning couldn’t come soon enough. Within 45 minutes of drinking my first cup of natem, I began seeing some interesting geometric hallucinations. They were tiny, moving lights forming a kind of spider-web pattern overlaid on my “normal” vision. Having experienced LSD many times more that 40 years previously, these hallucinations were actually pretty tame in comparison. I was expecting some of the pure terror that often accompanied LSD “trips” but natem is far kinder in its greeting. My biggest problem with this first experience, and as it turned out, for the next several nights worth of ceremonies, was that most of the energy of the natem was focused on very stern, almost violent body reactions. This first venture was for me almost completely dominated by heavy twitching and shaking of my lower extremities. My legs were reacting as if I had just completed a marathon. There was no pain, and I was very lucid, but at that point my main concern was that my shaking and jerking about would disturb others around me. While they were making contact with this spirit world, each in his or her own way (and silently, dammit! ), I was laying back on my mat behaving as if someone had inserted electrodes into both legs. As I lay there on the mat, flat on my back, I bent my knees and placed my feet flat on the mat. This slowed down the twitching and my motions were less noticeable to myself and others. The geometric patterns were gone by then, but I was developing a serious headache and some nausea. I found out later that having some water, and frequently drinking same would easily mitigate these reactions. But man, that nausea! Over the years I have been plagued with nausea to such a degree that I’ve almost become a connoisseur. Almost, but not quite. From heavy and painfully frequent doses of motion sickness as a child, to more recent and regular daily bouts, nausea and I are no strangers. Diagnosed as suffering from intractable nausea 4 or 5 years ago, I even went so far as to register, first in New Mexico and then in Hawai’i, as a medical cannabis patient to fight off daily, and often multiple times a day bouts of nausea. Standard anti-nausea medication would either put me to sleep completely or leave me semi-comatose and unable to function. At least with the cannabis (a personal friend of many years) I could walk and chew gum at the same time. Well the morning after my first natem ceremony I was so heavily nauseated that I knew that I was going to leave the ceremonies, leave the retreat, and somehow stumble my way back to Quito. This first morning, after having no sleep the night before, was enveloped in one of the strongest, most vicious encounters with nausea that I had ever had. After 6 decades of nausea, that’s saying something. And I was saying something too. Ursula, the German woman who earlier told me that after 80 previous encounters with natem, she was now ready to do some serious personal work, was laying on her sleeping bag to my right. I was explaining to her, while others were slowly dealing with dawn and their own journeys, that I was probably done. I needed to see Paul and back out of this retreat as gracefully as I could. It was fortunate for me that she happened to be next to me, or maybe she planned it that way. The 2 of us were older than the rest of the group by a full generation, and I am about ½ dozen years older than she is. In Catemayo, while waiting for the taxis, we began talking and resonated quite well. Though chronologically younger, as time went on she became my older sister and her help throughout the time we were all together for nearly 3 weeks, proved invaluable. And of all the help she provided, the most valuable was during that first morning. She explained that since the nausea was the strongest experience that I took away from that first ceremony, then nausea was my target, was my subject. Ursula believes that nothing is an accident and my initial encounter was my personal message to return to the nausea that second night and ask why. Somehow I believed her. And with her German precision she would hear of no talk of backing out. It was inconceivable and therefore impossible to discuss leaving. Get up, get dressed, we are climbing those cobblestone steps, all 163 of them, for breakfast. Thank you so much Ursula. You were, of course, correct. I did make it up those steps. I had breakfast and felt fractionally better. And as the day slowly moved by and I was able to grab an hour’s sleep I realized that I really did owe it to myself to stay for a second night and maybe I could gain some benefit. After all, I had been reading about the amazing properties of ayahuasca for years, and really, a substantial reason for finally coming to South America was to drink the brew. I had known for some time that ayahuasca is a healing enigma on the grandest scale. In the Andean countries and Brazil, many researchers, both psychiatric/psychological and medical have been deeply involved in trying to find out just how this mysterious plant works. It is, of course, an illegal substance in North America and all of Europe, as defined by the finest minds in politics. But down here, where people take a more rational view of the individual in relation to the environment, one can purchase the vine in an indigenous market a 10-minute walk from my room in Quito. 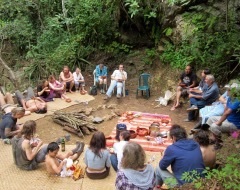 The term ayahuasca is loosely interchanged with both the vine, Banisteriopsis caapi, and the brew, which varies by country, by region, by shaman, and by what the particular shaman wants to accomplish for a particular ceremony. I refer the interested back to the Medicine Hunter for as much detail as you might like for these variations. His website, the Erowid website, and many others offer truly informative material for the truly open seeker of healing. In my personal case, some years back I was in a losing battle with what finally was diagnosed as clinical, or major depression. But fortunately my primary care doctor put me in contact with a psychiatrist who is vehemently opposed to pharmaceuticals. She, along with a number of other renegade psychiatrists, were working at the time with the University of New Mexico’s Medical School, studying the effects of DMT as a healing agent. DMT, from another crucial plant often referred to as chacruna, happens to play a critical role in the ayahuasca brew. My older sister Ursula would argue that none of this is an accident: my having depression, connecting with a scientifically curious psychiatrist, UNM/Med-School research, a plane flight to Ecuador, etc. Now DMT, you must understand, has also been classified in the USA as a dangerous drug of no medical value. Along with cannabis. These classifications were determined to be true through rigorous medical research conducted by, wait for it: YES!, politicians. Aren’t we happy that they are protecting us from ourselves? Umm, no, not really. With all of this information rolling around in my mind, there could be no debate. Following another tasty lunch and a shower, I came back to my mat, cleaned up some of the surrounding area, and got ready for the second, or Opening Ceremony. This turned out to be a brew of different proportions and, to put it in a most melodramatic way, it really did change my life. This entry was posted in Amazonia, ayahuasca, Natem, Plant Medicine, Shuar and tagged ayahuasca, Chris Kilham, Medicine Hunter, Natem, South American countries, spirit world on 2015-05-31 by kmalivuk. Rick; 2 things: somehow you changed your name to Makivuk? Your last 2 comments are submitted under your nom de what? Secondly is seeing what we want to see. I word-searched my last post and saw there was no mention of spiritual; at least in a religious sense. What I did mention is that there is a spirit world. And that’s where things get interesting. This other world, one that the Medicine Hunter and others refer to, is at this point more of a puzzle to me than anything I can clearly apprehend. Remember, I’m still a newbie here, so I hope I can convey at least a tiny part of a mystery that I have barely touched. The taoists of course tell us that that which can be named is not the true tao, that which can be spoken is not the eternal tao. So it looks as though I’ve got my work cut out for me. Stay tuned and thanks as always for your vision. Maybe then you could paint us a picture? this is DMakivuk by by way ;o)> but yeah, I’m looking forward to the next installment – I love living vicariously!